Professor John Borelli of Georgetown University was the special guest at Temple B’nai Israel on Sunday, May 1, for Holocaust Remembrance Day to speak about the 50th anniversary of Vatican II and its impact on Jewish and Catholic relations. 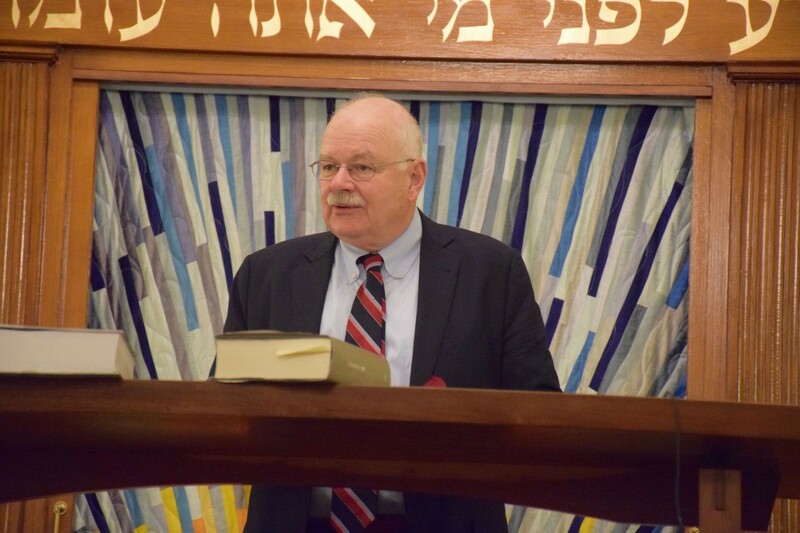 EASTON — Professor John Borelli of Georgetown University was the guest speaker at Temple B’nai Israel on Sunday, May 1, for Holocaust Remembrance Day. He spoke about the 50th anniversary of the Catholic Church’s Second Vatican Council and its declaration on the relationship of the church with non-Christian religions. The event began with a short service in which the Yom HaShoah Yizkor candles were lit to remember those who died during the Holocaust. Louise Shapiro, a survivor of the Holocaust; president of Temple B’nai Israel, the daughter of two Holocaust survivors Elaine Friedman; and another survivor Ernst Selig were present to assist in lighting the candles. Hyman said it was also important to remember to keep the message alive that this type of atrocity should never happen again. Borelli is the special assistant to the president for interreligious initiatives at Georgetown University, which entails designing and coordinating special projects that further the university’s contributions to interreligious dialogue and understanding. “It is important that we are here not only to acknowledge Yom HaShoah but also to learn and hear some of the behind the scenes history from a real scholar,” Hyman said. The topic Borelli addressed was “Vatican II: 50 Years of Nostra Aetate — Where We Were, Where We Are, Where We Are Headed.” Borelli spoke about how the Vatican II came to be and noted this was the first time he had ever spoken at a synagogue. The Nostre Aetate was the church’s declaration on its relationship with non-Christian religions. “Nostre Aetate decries hatred, persecutions and manifestations of anti-semitism directed against Jews at anytime and by anyone and reproves, as foreign to the mind of Christ, any discrimination or harassment against men and women because of their race, color, condition of life or religion,” Borelli said. Borelli also said Vatican II began to shift, with integrity, 1,900 years of relationships between Christians and Jews. Borelli’s speech began with the story of Pope John XXIII, who summoned the Second Vatican Council, which addressed the relations between the Roman Catholic Church and the modern world. Borelli talked about the date of June 13, 1960, when a meeting took place between Pope John XXIII and Holocaust survivor and scholar Jules Isaac. “Isaac was just one of a small group of Jews and Christians active in Europe to correct the Church’s teachings on the Jews,” Borelli said. “This meeting is so important to the history of Nostre Aetate that the declaration most likely would never have happened without it.” The declaration was passed by a vote of 2,221 to 88 of assembled bishops and was promulgated on Oct. 28, 1965 by Pope Paul VI. The Holocaust influenced the thinking and actions of both Pope John XXIII and Pope Paul VI, Borelli said. The Holocaust initiated a turning point in formal Catholic-Jewish relations, triggering soul-searching among religious people trying to understand the persecution and murder of six million human beings solely because of their religious beliefs. Borelli said after Pope John XXIII’s encounters with Isaac he found it necessary to have Cardinal Bea, a German Jesuit priest, look into the questions of the Jews. “The Nostre Aetate originated in an effort to address the relations of Jews to the Church,” Borelli said. Borelli also talked about Pope Paul VI, who was elected after Pope John XXIII died and addressed many of the issues that arose during the first period of the council.